Clash Royale New Cards for September Update? 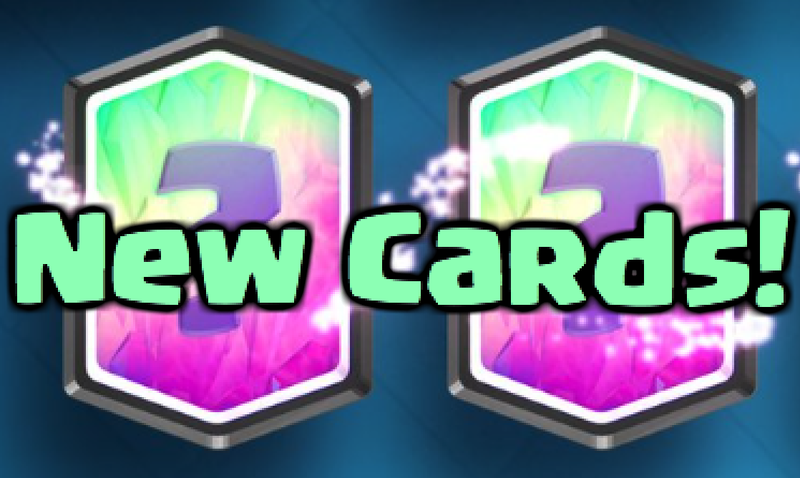 Clash Royale promised to have new cards coming out with every new update, so that raises the question if there will be new troops in this September 2016 update. Here are a few new card ideas I had for the September update sneak peeks! New Cards for September Update! Lava Pups: Lava pups would be exactly what comes out of the lava hound when it explodes, except there would only be 3 of them. These could be a cheap defensive card to take out a small tank or used well for a good offensive push. Solider: The solider would be similar to the princess, with a machine gun that does little damage, but adds up after a while. The solider would have a good range, longer than musketeer, but not quite as long as the princess. He would also own a strong shield that could take fireball damage, but after the shield is gone, he is very weak. He wouldn’t be able to shoot air troops. Windmill: The windmill would be almost exactly as it sounds. It would be kind of like an air sweeper, except it would only work on ground units. All defense seeking units would be pulled by the windmill, so it would be a strong card to place in the center of your base to slow down almost any troop. Demon: The demon would shoot out acid that would work similarly to the poison spell. The pools of acid that the demon shot out would slowly expand encompassing more troops even as he dies. His acid wouldn’t be able to kill air troops, but to make up for it, he would have as much health as the witch. Fire Spirits Swarm: For the fire spirits swarm, think the minion horde except fire spirits. There would be 6 fire spirits that would annihilate almost any card in the game. The problem though, just like the minion horde is that they could all by destroyed with a single zap or arrows card. High risk, high reward card! Freezer: Just like the relationship between fire spirits and minion horde, imagine this one like the furnace. Expect the freezer wouldn’t spawn fire spirits, it would spawn ice spirits! One at a time, but very high spawn rate. Gladiator: For the gladiator, the best way to picture it is as a mix between the mini-P.E.K.K.A. and the P.E.K.K.A. The gladiator would have a shield though with medium speed and a pretty good amount of health. It would swing faster than both the P.E.K.K.A.s, but do a lot less damage per swing. Healer: The healer has been long talked about, but in order to make it an effective card, it can’t be too OP. She’d have to have an extremely low HP, along with her healing capabilities being able to be beat easily by a tower. She would be able to do splash heal though, meaning minion hordes could do a ton of damage! Elixir Storage: The elixir storage is a pretty simple concept. As long as you have it up on your side of the map, you would be able to hold 12 elixir, instead of 10. The elixir count would max out at 12, but you could build bigger pushes because of this. Dragon: The dragon has, like the healer, been a long debated topic in Clash Royale. It would have to have an air defense or some sort of air defensive card added with it, or it would be too strong. The dragon would do insane damage to any card, along with the tower, but it would be very high elixir cost. The dragon would be such a neat card to see and would be interesting to see what players used it with and for. Again, there would have to be some sort of air defense added in. So that is all the new card ideas for Clash Royale’s September update that I have right now! Comment below if you have any good troops you’d like to see implemented in the next Clash Royale update! Maybe add a dark elixir bar that only builds up to 5 DE, and is added at like, level 8 or something. Dark elixir cards are still in your deck but just takes two card slots instead of 1, so they are not too op. Pingback: Clash Royale New Cards for September Update? | Clash of Clans Guide, Strategies, Tricks and More!